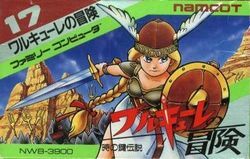 Valkyrie no Bouken: Toki no Kagi Densetsu, which can be translated into English as "The Adventure of Valkyrie: Legend of the Time Key", is a game developed by Namco for the Famicom in 1986. It came out a few months after The Legend of Zelda and Dragon Warrior, and many comparisons have been drawn between these games. The simplest comparison is that Valkyrie no Bouken presents a scrolling overworld like Dragon Warrior, but features a real time combat system similar to Zelda. The game is virtually unknown in the United States, but it is highly revered in Japan. The Valkyrie is something of a minor mascot for Namco, having not achieved the worldwide fame that Pac-Man has, but being very much adored in Japan. Valkyrie no Bouken is the first game in which the Valkyrie appears. She is depicted on the box as having blond hair, yet due to the graphical limitations of the Famicom, the designers chose to give her black hair in the game. Subsequent appearances of the Valkyrie on later hardware feature her with blond hair. The Valkyrie has gone on to have cameo appearances in several other Namco games, including Namco x Capcom, in several of the Tales series, as a third costume choice for Cassandra in Soul Calibur II as well as the ability to purchase her outfit in Soul Calibur III, and references to her game have appeared in the Mr. Driller series. Valkyrie no Bouken was followed up with Valkyrie no Densetsu in the arcades in 1989 which featured two player simultaneous play, with a console conversion released for the PC-Engine. In 1992, Namco released a prequel to Valkyrie no Bouken on the SNES entitled Xandra no Daibouken: Valkyrie to no Deai featuring the Valkyrie's green amphibian-looking friend, Kurino Sandra. (It was released in Europe as Whirlo). Valkyrie no Bouken was resurrected for the PlayStation in 1998 on Namco Anthology 2, which featured an upgraded (and more linear) version of the game side by side with an emulated version of the Famicom original. In 2007, Namco released a true upgrade of the original game with enhanced graphics (featuring blond hair on the Valkyrie) for Japanese cell phones that support the i-Apli system. Having no text throughout the entire game, the game is fully playable by non-Japanese speakers. However, in 2001, the translation group SGST released a patch that converts the title screen into English (which provides a very phonetic translation of the word Valkyrie as Valecule) and the player select screen. However, as a result of changing the title, the translation corrupts the ending, which, ironically, is already presented in English. To fix all the issues with the SGST translation, the translation group DvD Translations released a much more correct translation on February 23, 2009. If you wish to play the game in English, this is the version that is recommended. The key of time that rested in the center of the face of the clock tower had long since been used to seal away the ancient evil that lies within. Until one day, the clock tower mysteriously stopped working. In an effort to rewind the clock, a villager takes it upon himself to do just that. Fumbling with the key, the villager drops the key of time, foolishly. In a frantic manner, the villager picks up the key and tries to reset it back into place before a catastrophe befalls Marvel Land. But it was too late! The ancient evil of legend. Zouna, the Dark Wizard who manipulates time itself was unleashed upon the world once more. And to prevent anyone else from sealing him away once again, Zouna takes the key of time for himself. Finally freed after many years, Zouna wastes no time in wreaking havoc and chaos over Marvel Land. Zouna unleashes his manifested darkness over the land, and lays waste to the countryside. Feeling confident in his reign, Zouna constructs his castle in which to preside over Marvel Land from. The peaceful inhabitants of Marvel Land cried out in terror as Zouna's manifested darkness came after them one by one. Zouna's darkness corrupted the hearts of anyone it came across, and possessed them against their wills. Once thriving towns and villages fell into ruination. Family members were parted from their loved ones. Only a few scattered towns remained standing; forming a last bastion in resistance to Zouna's dark invasion. A futile effort. Even Kurino Sandra would come to meet his heroic demise, subdued by Zouna's power. Marvel Land is in dire need of a savior! The desperate call has been answered by the heavens. Valkyrie, a fledgling shield maiden descends to Marvel Land from heaven. Her first adventure, she wields a simple shield and a mace of light. Vowing to save Marvel Land from the darkness that has consumed it. Her adventure now begins! This page was last edited on 4 March 2014, at 16:29.